Spider is a David Cronenberg movie, but it looks like a David Lynch film. If that makes you arachnophobic, please reconsider. Although both directors can be frustratingly cryptic, Spider is much more approachable than the recent works of either director. 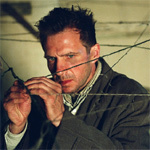 Spider is the nickname of our schizophrenic protagonist, played by Ralph Fiennes. He gets off a train, shuffling, gaze downturned, wearing clothes from some charity organization. He seems to be little more than a walking zombie. One wonders if part of his brain has been injured or removed. He has a piece of paper with a name and an address, which turns out to be a halfway house, his new home. An old woman takes government money to care for Spider and half a dozen other inmates. The plot plays like an unraveling mystery, but the question isn’t “whodunnit?”, it’s “how did Spider lose his mind?” His strolls by the nearby gasworks awaken childhood memories so real that adult Spider can stand outside the window and watch. Each flashback adds to a Freudian picture of Spider’s troubled childhood, in which his father cheated on his mother, then killed her and married his mistress, at least from Spider’s point of view. A flashback reveals the source of Spider’s nickname. His mother told him about how mother spiders treat their young. To his mother, it was an interesting factoid. To a son, it was a disturbing, haunting image. Spider probably obsessed over the story, which to his mother looked like it was simply a favorite story of his. From these humble beginnings, Spider’s madness grew into a debilitating paranoid psychosis. The film is complex, not complicated. It’s full of texture that is used to link together disparate times, places, and points of view. Spider makes a twine web in his apartment, which is like the one he made as a child, and it’s also like the jigsaw puzzle he works on and the broken window from his hard days at the institution. The repeated visual themes aren’t metaphors — they aren’t that simple. But they do show some of the patterns in Spider’s life. They allow us to look into his character at different times in his life, each moment as real, to us and to him, as if it were the present. Fiennes’ performance is outstanding. He’s still a little too good-looking to be a believable everyday madman, but that’s no fault of his own. Gabriel Byrne is a little shallow as the overbearing, irresponsible father, but the performance is right on-target, because his character is only ever seen through the eyes of a child. Perhaps the most amazing performance comes from Miranda Richardson, who plays not only Spider’s mother, but, now and again, all the other women in his life. Cronenberg’s portrait of madness is compelling. The opening scene of the smelly, shuffling Fiennes getting off a train immediately pulls you in. What is wrong with this man? Can he really function well enough to ride a train? Is he dangerous? As in Lynch’s latest movies, there isn’t a single key that will let you “get” this movie. Cronenberg seems to say that because Spider is schizophrenic, we can’t really know the objective truth about him. His story is likely to have some truth in it, but without the point of view of another witness, we’ll never know for sure. That doesn’t mean we can’t still learn a lot about him and find him a fascinating subject. Spider definitely deserves a second viewing and a strong recommendation. It is 2003’s best film to date.